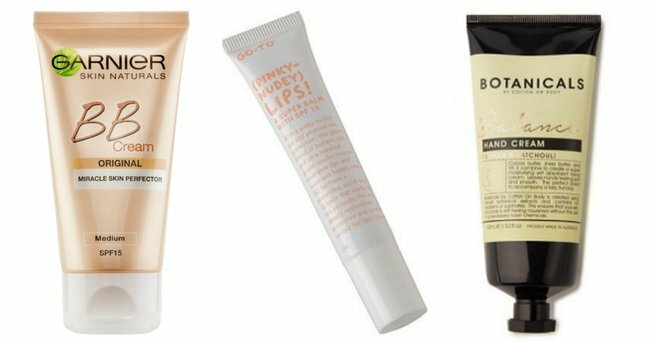 Editor's Pick: 7 must-have beauty products. I’d like to take a moment to thank those hard-working beauty products that take up residence in millions of handbags across Australia. It’s not a pleasant life for them, constantly surrounded by bobby pins, rogue gum, pens and forever tangled headphones, but they’re loyal to us nonetheless. Like many women, my day can see me thrown into a meeting, dinner or drinks at a minute’s notice, so I like to fill my bag with products that should be in the gifted and talented program. These beauties allow me to fake looking put-together and don’t weigh a tonne. As a moisturiser, colour corrector, foundation and SPF 15 sunscreen all in one, Garnier BB Cream has definitely earned its place as a handbag essential. It has the consistency of a moisturiser (which is uncanny because it offers 24-hour hydration), contains your skin’s best friend Vitamin C to give your skin an antioxidant kick, and glides onto skin smoothly to cover blemishes and uneven skin tone (I usually add a second layer as I prefer a wee bit more coverage). Edwina wearing Garnier BB Cream. Image: Supplied. Plus, it’s my favourite - non-comedogenic - meaning it won’t clog pores. It also comes in normal, oily to combination, sensitive and anti-ageing. Despite using primer and setting my makeup with translucent powder, I often look in the mirror at around five pm and see the reflection of a woman who appears to have rubbed olive oil all over her face staring back at me. I’ve been using blotting oil tissues since I was a teenager and they’re wonderful for de-shining, particularly if I’m on the go. The best part is they don’t rub off all my makeup with them. The latest product to join Go-To Skincare’s line up boasts protective SPF15, nourishing medical grade lanolin, shea butter (the second best kind of butter) and the kind of pinkey nudey tint you’d hope to result from a product called “Pinkey Nudey Lips”. The sheerness and glossy finish mean it can be applied sans mirror on the bus, train, walking, talking, texting or swimming (not recommended). It gives you that polished done look despite possessing filthy hair and the fact you’re on your last pair of clean undies. If I rummage around in my handbag and my fingertips don’t caress this product, I start to panic. If you need me, you’ll find me atop of Mt First World Problems. But seriously, this traceless hairband has saved my easily dentable hair many a time. It’s great if you’re headed to the gym and would prefer to give your hair the old dry shampoo treatment over a wash. They’re also great for people who constantly lose regular hair ties - I’ve owned the same packed for over a year and haven’t lost one. Fail-safe grippage. Image via Invisibobble. There was a time where a gift of a candle or hand cream was met by utter disappointment. Now I’m approaching my 30s and my skin is drier than ever, a hand cream is the holy grail. This one is particularly lovely. I’m a sucker for a vanilla scent and the vitamin E, shea butter and sulphate and paraben-free formula is a win for my skin. I quit buying coffee regularly over six months ago, so a break from my busy day to slather this on my hands is my equivalent. Our fav paraben-free formula. Image via Cotton On. Funnily enough, it was my dad who taught me that the best anti-ageing tool in our artillery is sunscreen. Skin cancer is no laughing matter and the sun’s harmful rays can creep up on us when we least expect it. This brilliant mini-version is super lightweight and perfect to pop on exposed shoulders and hands throughout the day. Is it a balm? Is it a lipstick? Is it magic? It’s all of the above. Which is a fantastic result for anyone who, a) doesn’t have time to get their lipstick application spot-on-perfect. And b) anyone who needs the nourishment of a balm with a vibrant, pigmented pop of colour. The perfect pop of colour. Image via David Jones. What must-have product is in your handbag?